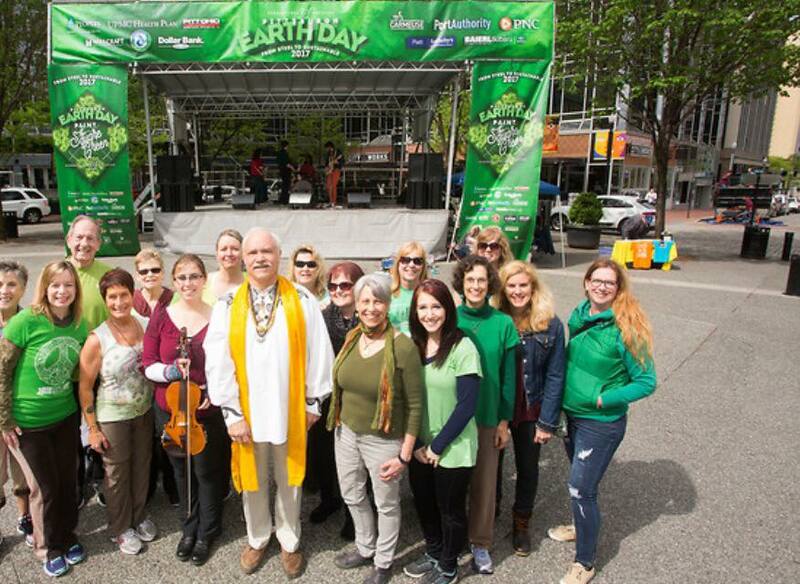 I had the wonderful honor of opening Earth Day for the City of Pittsburgh PA, and several other related events. My journey began by opening Site Nite in Pittsburgh where I spoke for an evening about my new narrative for humanity and shared about the last twenty years of my peace journey. It was a moving evening with lots of laughter and lots of tears and I owe special thanks to Regina Rivers and the other organizers of Site Night for packing the house and for their six months of planning. Next I spoke at the Convention Center in Pittsburgh to a business breakfast of CEOs sponsored by Dollar Bank, the Mayor’s office, and a number of Pennsylvania’s foremost corporations where I had the opportunity to share thoughts on how business can participate to change the future of the planet by switching to responsible planning and manufacturing that is earth friendly and which takes into account the costs to our planet of pollution and profit only objectives. I also shared that business should begin to think outside of the box when considering energy sources and hopefully moving into the realms of geothermal power transitioned into laser energy and bounced off of satellites to our cities. 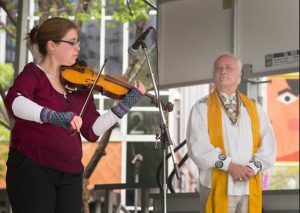 Following that, I opened Earth Day for the city at the city square with an opening speech and shared the World Peace Violin. The violin was played by Lara Konefal-Shaer who was a local violinist, and she was beyond amazing! We also had fantastic group of wonderful Flash Mob Dancers introduce us. Then to finalize things, I taught a six hour peace training called Pathways to Peace at the University of Pittsburgh which was also well attended, and was unexpectedly honored by the Mayor of Pittsburgh with a Proclamation honoring my many years of work toward a sustainable planet and world peace by creating “Journey to Peace Day” for the City of Pittsburgh. All in all, it was a whirlwind of events, and I am deeply honored to have been able to contribute toward a better world!